Abuja — "I sold everything I had in Nigeria in preparation from my green card. When I was denied it, I fell into a depression and decided to turn to alcohol and drugs to ease off my disappointment," says Daniel Oyewale as Nigeria prepares to commemorate World Mental Health Day. This year, the theme is "Young people and mental health in a changing world", to draw attention to the importance of mental health among the youth. "I really wanted to move to the United States of America and build my future, my world came crashing. 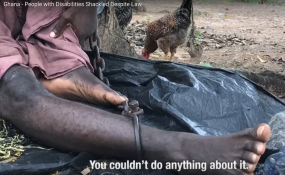 Before I knew it, weeks turned into months, my sadness became chronic and I displayed full blown symptoms of a mentally challenged person", Mr Oyewale, is a 30-year-old first child in family of six. His mother, a registered nurse in the US filed for Daniel's green card over eight years ago but he was denied at the Consulate based on his age. Fortunately, Daniel's father conducted vigorous research across Abuja and discovered a mental health facility at the Karu General Hospital in Abuja. Daniel was admitted for three months and received proper treatment at the hospital's psychotherapy facility. Though Daniel has been prescribed some strong and expensive medications over the next five years, his health has significantly improved and he is back on his feet and has a full time job. "I hate taking these treatments, but it has honestly helped me to fight off the demons of depression," he said. According to the World Health Organization (WHO), at least half of all mental illness cases begins by the age of 14 years but most cases go undetected and untreated, with serious long-term consequences for mental health. In addition, at least 800,000 people die every year due to suicide and it is the second leading cause of death among the 15-29 year age cohort. In a 2015 report published by WHO, Nigeria had 20.3 suicides per 100,000 people per year. According to Dr John Konto, a Resident Psychiatrist in the Behavioural Medicine Unit, Karu General Hospital, at least three patients visit the facility on a daily basis as a result of depression. "From our research, the main cause of depression in Nigeria, especially in youth is substance abuse. Other causes include economic hardship and even heartbreak. The key to full healing is consistency in psychotherapy and medication," he said. Some symptoms of depression mentioned by Dr John include manic or gloomy episodes separated by periods of normal mood. Manic episodes involve elevated or irritable mood, hyperactivity, pressure of speech, inflated self-esteem and decreased sleep. One of the major challenges in treating mental illness in Nigeria is that the health care facilities and mental health care professionals are not enough in number or well equipped to handle the burden of mental illness. There are several barriers to treatment for individual Nigerians which include the following: such as the lack of understanding of the root causes of mental illness, lack of financial support to get mental treatment, lack of social support (family, friends, neighbours), the fear of stigmatization concerning being labelled as mentally ill or being in association with the mentally ill, and the consultation of non-professionals leading to prolongation of the illness. According to Dr Nnena Ezeigwe, the Head of Non-Communicable Diseases, "The Federal Ministry of Health (FMOH) is concerned about the rising cases of mental health disorders and associated substance abuse. A comprehensive mental health action plan 2013-2020 has been developed by WHO and was adopted by the 66th World Health Assembly. The plan focuses international attention on a long-neglected problem of mental health and is firmly rooted in the principles of human rights. In addition, the action plan calls for changes. It calls for a change in the attitudes that perpetuate stigma and discrimination that have isolated people since ancient times, and it calls for an expansion of services in order to promote greater efficiency in the use of resources. The WHO has developed tools to support parents, caregivers and teachers to build life skills of children and adolescents and to assist them cope with everyday challenges. WHO recommends continuous training for primary health-care workers to enable them detect and manage common mental health problems in community settings. Depression is one of the priority conditions covered by WHO's Mental health Gap Action Programme (mhGAP). The Programme aims to help countries increase services for people with mental, neurological and substance use disorders, through care provided by health workers who are not specialists in mental health. WHO, has developed brief psychological intervention manuals for depression that are available on the website: Thinking Healthy: A manual for psychological management of perinatal depression and Problem Management Plus (PM+): Individual psychological help for adults impaired by distress in communities exposed to adversity.